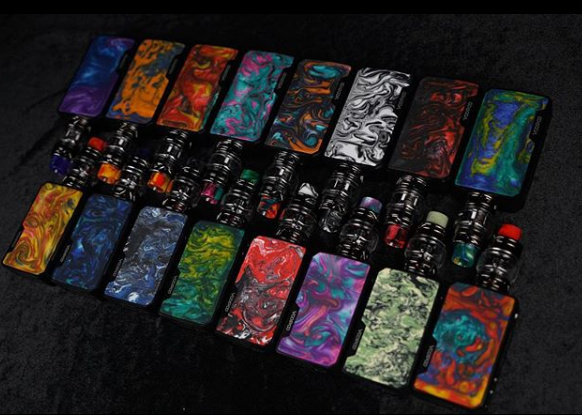 Wanna try VOOPOO New Drag/Mini for Free? We’re looking for testers here! 4 testers will draw here. Most importantly: Make sure you’ll post review on ELR before Oct.31th, Or in 1 week after receiving the product. 4 Testers will draw here on October 12th.Come on! sounds threatening. You not allowing much time for testing there between time awarded, shipping, testing and compiling thoughts about it. It does take a while to put a device threw tests to properly review it. That thinking that is doesn’t is whats wrong with most of the reviews available to us. Very interested in the new Gene Fit chip. It was the Gene Fan chip that made the original Drag stand out from the crowd. I agree with @worm1, you need to give whomever you select time to try out the devices and to write the review. No do VooPoo review for you. No wine before it’s time! so many color options. i like it. I happen to know a reviewer who does 1 review about every 2.4 days, he claims to have done vape reviews since late 2016 and have done around 300 reviews to date. So do the math, I’m not that quick but I’m sure I could come up with something in your allotted time frame. If I could get 2 of your device around October 15th, I am sure I could write something about the operation of the device, and my opinion of it, and have something published around October 31 2018. It would be best if you send 2 devices so my wife can use one also to help me by sharing her opinion on the device. It would be even better if you could include a 3rd device that I could raffle off in a contest for the ELR readers of the review. I am not really a reviewer, so for the most part I would just be sharing images and information about the operation of the device. You would have to be willing to accept my review as-is because if I notice problems with a device I will mention that in my review. I’ll do one too VooPoo. Ha, I’m a poet and I already know it. I am sure y’all already have them in the States, so it wouldn’t take long to get here. Thanks, @Sprkslfly for that subtle reminder. Check! Definitely older than that. I would be interested in seeing how your chip performs. Looks more ergonomic than the edgy Drag. Sure, if it gets here in time. I don’t have VOOPOO Drag yet. Despite this, I would have great pleasure in trying out VOOPOO Drag 2/Mini. Its appearance is unique, the color scheme is at a height! It is interesting to try live in the work of the Revolutionary Gene Fit Chip! 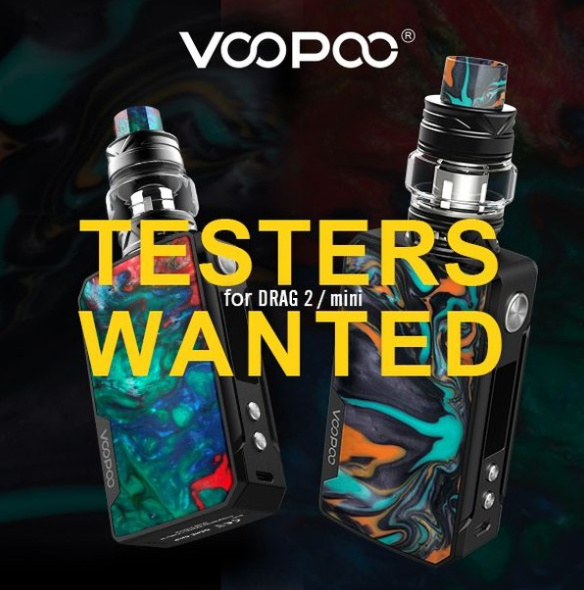 If I win the opportunity to test VOOPOO Drag 2 / mini, I will review it on time! The product will be shipped once the testers are picked, and it only takes 3-5 days for shipping. We give almost 10 days for testers to test it and write review, I think the time is enough. The products will be shipped on October 14th-15th, it takes 3-6 days to arrive in America. For some remote countries and cities, Just make sure post the review in 1 week after receiving the products. I think the Drag2 is a gorgeous looking mod, one of the better looking mods on the market. The resin panels give it a really sharp look, a high-end-ish look if you ask me. If this rendition of the Gene chip is equal to or better than the last it’s going to be a great chip because I own the Voopoo Too and it’s the quickest firing mod I own. Hope 25s and 26s fit on top with no overhang, I’m sure they do, otherwise that would not be good. The matching drip tips look really good , that’s a eloquent touch. The original Drag was one of the most popular mods of 2017 and the gold ones and special editions rocked 2018. So there is a lot of hype to live up to with this release. I’m definitely not a reviewer just a consumer, I do know my way around a apv though. I think 7-10 days is enough time to give your thoughts on a device/kit. Recently bought a new mod and kit 7 days ago and in that time, I have used that device. i would feel able to give a fair summary of how the device and tank have performed for me so far. If chosen, I’ll try to post my thoughts on this mod before 31st of december, if I receive it with enough time to use it. I have a channel on Youtube with vape - reviews http://www.youtube.com/c/Chelovek_oficial . If i win - i will do video review on this amazing product! I loved the looks of the original Drag and have heard that it also performed very well, though I have never tried one for myself. The new ones also looks very cool, and hopefully performs even better. I am in no way a professional reviewer but I have written a couple of reviews before. Putting out a review in 7-10 days should be feasible for me. If I am chosen I would prefer the Drag 2 over the Mini. I’m of legal age, definately…lol. I like the looks of this one a lot, it’s beautiful in fact. I have used the original drag and it’s still one of my favorite mods. My original carbon fiber/silver mod continues to work flawlessly, it’s one of the first runs, it has the date hand written on the inside, I’ve used it daily with no problems. I’d be happy to write a review once received. Thank you for the chance.